I’m always on the lookout for easy go-to meals. While I tend to rely on my go-to recipes a little too heavily, eventually making myself totally sick of them, I’m still grateful to have these gems in my arsenal! My latest favorite go-to meal is simple stuffed shells. No meat involved, super easy to make, and mighty delicious. It’s a little more effort than throwing together spaghetti, but not much. You just need to think ahead a bit – make sure you have the cheeses on hand, and give yourself time for baking. But, seriously, they’re easy to make. And my girls gobble them up. 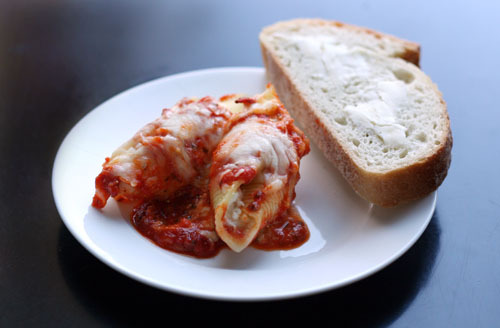 Please feel free to share your own stuffed shells recipe! Here is how I’ve been making mine lately. Yum. 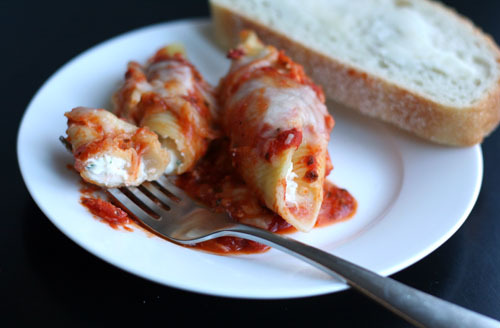 Simple, delicious and reliable go-to recipe for stuffed shells. Boil shells as per package directions. Drain and make sure they don’t stick to each other. Mix together the ricotta, garlic, salt, pepper, basil, and egg. Stuff your shells, maybe about a tablespoon per shell. Use up all the filling for about 20-24 shells. 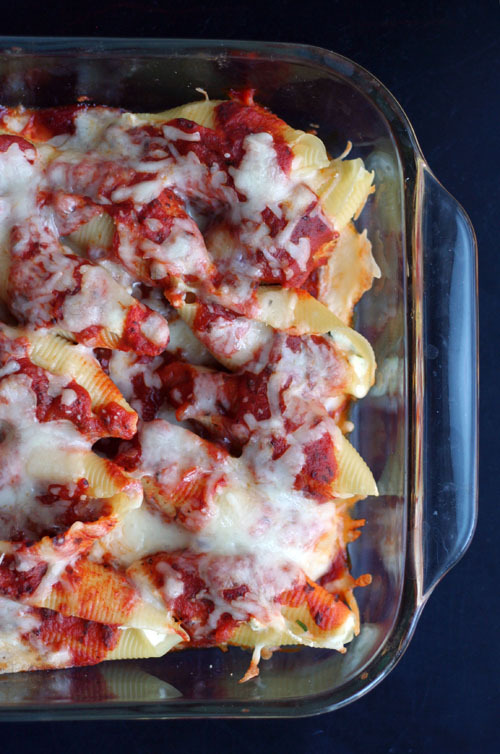 Place shells in a 9Ã—13 baking dish, drizzle with pasta sauce (I think I used about half of a jar or so), then sprinkle the top with mozzarella cheese. Bake in 350 degree oven until hot and bubbly, about 25-30 minutes or so. Looks great Jane. Now if they only made gluten free shells I’d have this one made. But I bet I could wrap them in lasagna noodles and get the same effect. It’s that or make my own shells, but that certainly would take the ease out of it! Thanks for sharing! Yummy! Trying to go meatless a night or two of the week and I am sure my husband will love these!!! Thanks, will probably try them out tomorrow or the next day! I make mine with spinach mixed in the ricotta (with a hint of nutmeg too). Of course my kids don’t like them. ; ( This is a great alternative for those picky palates! stuffed shells are always, ALWAYS welcome in my house! these look great. mine are similar, i just add spinach, and sometimes a 1/2 tub of cream cheese to make it less “tomato-y” for my picky, sweet husband. Yum! I like the idea (from the comments) to add spinach. Although to be honest, I’m sure my husband would prefer it without any GREEN added! I make a dish really similar to this. I sautee veggies (with the garlic and a little olive oil) that I’ve chopped in my cuisinart. Usually zucchini & yellow squash. Let them cool a bit and mix together with your cheese/egg mixture. The kids get another shot of vegetables and they gobble them right up! love all these veggie and spinach ideas! so smart…I’m totally doing it! We love stuffed shells at our house too! You know … it’s time to make stuffed shells again! This is a link to a recipe for Taco Pasta Shells. Sounds weird, but very good. i posted it on my wall once, and at least 10 friends requested the recipe. Now 5 or 6 use it regularly. They freeze well too. I used to love when my mom made stuffed shells as a kid! My husband won’t touch ricotta though, so I’ve never made them, though I’ve been curious about substituting goat cheese for the ricotta. I mix in the spinach, but my aunt adds pureed zucchini (they get lots of it from their garden) into the cheese mix and no one seems to notice. Also, if you put the filling into a pastry bag (no tip–or just a ziploc with the corner cut) filling the shells is faster. This dish looks amazing!!!! I have a soft spot in my heart for a really yummy meat sauce, which I posted an amazing recipe for here http://misschefy.wordpress.com/2010/08/19/homemade-spaghetti-and-winston/. So I definitely might try this recipe with my homemade spaghetti sauce. Thanks for the tip! I would love to make a spinach and chicken stuffed shell recipe with an alfredo sauce sometime. My husband and kids LOVED them! Here’s my stuffed shells tip: When I do stuffed shells I put my cheese/spinach/whatever mixture into a ziploc bag and cut the tip off. You know that trick, right? It makes the actual stuffing part so quick and tons less messy! Love them! I love these too. For a little lighter version, I use cottage cheese rather than the ricotta, and you can barely taste the difference. I started using cottage cheese vs. ricotta in lasagna a few months back, and I like the lightness to it. Try it. Let me know if you like it! I add some fresh spinach to the stuffing! That gives you some greens in there, too! My wife doesn’t like ricotta – can someone please confirm that she’s crazy so I can show her? She doesn’t believe me when I tell her. I confirm…she’s cah-ray-zeee… did I just cause a family rift? I will say this…when I got obsessed with creating the perfect cannoli recipe a few years back, I did discover that the texture of the ricotta in the fancy cheese section of the store is way different than the regular old ricotta in the normal part of the store. maybe try that and see if it makes a difference for her. it’s the only kind of ricotta I’ll use for cannoli. I have just remembered I have shells in my pantry and I’m always in need of a use for the majority of a package of ricotta cheese. It seems I only use a few tablespoons or 1/4 of the package, but then don’t know what to do with the rest. Ta-da! Stuffed shells! Thanks for the idea and the recipe. Can’t wait to try it out! I just want to say, I’ve enjoyed this blog so much since I discovered it a few weeks ago. Jayne, I use your recipes many times a week and everything has been wonderful! I’ve been impressing my picky boyfriend with all the goodies I keep bombarding him with. Tonight I made these stuffed shells, and he’s not big on pasta, but he scarfed these down! To really impress dinner guests, I like to stuff the small shells. Tedious but a real conversation starter! jk. Stir a tablespoon or so of pesto in with the filling. It really takes it up a notch.